Raising the minimum wage would be good for our economy. A higher minimum wage not only boosts workers’ incomes—something that is sorely needed to boost demand and get the economy going—but it also reduces turnover and shifts businesses toward a high-road, high-human-capital model. Still, some policymakers may be nervous about increasing the minimum wage while unemployment is so high. Yet, both the federal and states governments have raised the minimum wage numerous times during periods of high unemployment and the evidence indicates that employment has been unaffected. Similarly, a simple analysis of increases to the minimum wage on the state level, even during periods of state unemployment rates above 8 percent, shows that the minimum wage does not kill jobs. Indeed the states in our simple analysis had job growth slightly above the national average. 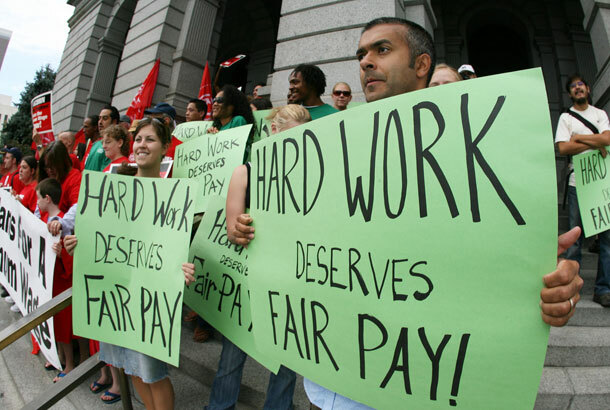 In our analysis we reference five academic studies of the minimum wage that include periods of high unemployment, cover different geographical areas and different time periods, and use a range of methodologies—from small case studies to large econometric analysis—lending great credibility to their findings. The most recent studies are considered significant improvements over all previous studies because of the methodology employed. One recent study, for example, used the same methodology as earlier studies finding a small disemployment effect on teenagers, but the newer study controlled for the condition of the regional economy, something previous studies had failed to do. Additionally, other recent studies have examined U. S. counties that border one another but had different minimum wages (because they are in different states). All the studies came to the same conclusion—that raising the minimum wage had no effect on employment. Moreover, all of the studies included cases where the minimum wage was raised during a period of high unemployment. These studies should go a long way in assuaging policymakers’ fears and boost their willingness to raise the minimum wage. While academic studies should inform the minimum wage debate, they do not always provide the kind of evidence that policymakers and the public can easily digest. To help highlight the results underlying these academic studies, we provide a simplified analysis of state minimum wage increases during periods of high unemployment. We examined every state minimum wage increase from 1990 through 2011 where the state unemployment rate was above 8 percent. We then compared the rate of job creation over the next 12 months following the minimum wage increase in these states to the national average. Of the 35 cases where a state minimum wage was increased during a period of high unemployment, 21 saw job increases over the next year at a rate faster than the national average, while 14 witnessed job growth at a rate below the national average. The average rate of job creation for a state after a minimum wage increase during a period of high unemployment was 0.48 percentage points above the national average. The median employment growth was also slightly above the national average. A few states, including Alabama and Tennessee in 2009, saw 12-month job increases well above the national average. Some states, however, including Michigan in 2008 and Arizona in 2011, had significantly worse employment outcomes than the national average. But the average state that increased its minimum wage had 12-month job growth that mirrored the national average, with most states doing slightly better than the national average. Likewise, separate analysis of minimum wage increases that occurred as a result of federal action versus increases coming from state action yields nearly identical results—national and state employment growth virtually matched. While this simple analysis does not have the rigorous controls required of full-blown academic research, these results provide additional evidence demonstrating increases in the minimum wage are unlikely to have harmful effects on employment. When combined with the academic studies, these more anecdotal findings provide a compelling picture of the employment effects of the minimum wage. Policymakers should feel confident that raising the minimum wage would not have harmful employment effects and instead would likely provide the kind of boost in consumer demand that our economy sorely needs. 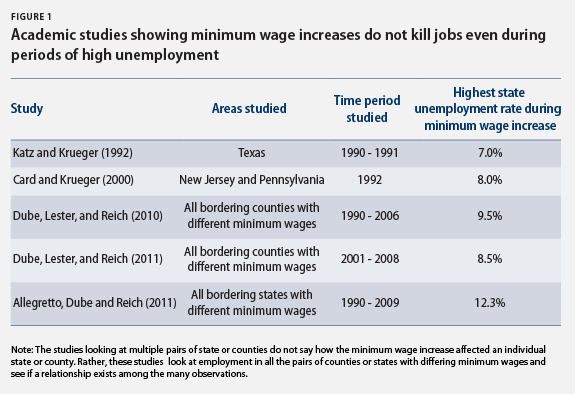 Arindrajit Dube, T. William Lester, and Michael Reich, “Minimum Wage Effects Across State Borders: Estimates Using Contiguous Counties,” The Review of Economics and Statistics 92 (4) (2010): 945 – 964. Arindrajit Dube, T. William Lester, and Michael Reich, “Do Frictions in the Labor Market? Accessions, Separations and Minimum Wage Effects.” Working Paper 5811 (IZA Discussion Paper Series, 2011). David Card and Alan B. Krueger, “Minimum Wages and Employment: A Case Study of the Fast-Food Industry in New Jersey and Pennsylvania: Reply,” American Economic Review 90 (5) (2000): 1397-1420. Lawrence F. Katz and Alan B. Krueger, “The Effect of the Minimum Wage on the Fast-Food Industry,” Industrial and Labor Relations Review 46 (1) (1992): 6-21. Sylvia A. Allegretto, Arindrajit Dube, and Michael Reich, “Do Minimum Wages Really Reduce Teen Employment? Accounting for Heterogeneity and Selectivity in State Panel Data,” Industrial Relations 50 (2) (2011): 205-240.